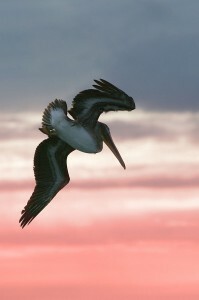 Pelicans are prolific fishers. And they don't struggle with the ethicality one bit. My husband has begun teaching our kids how to fish, and I’m not sure how I feel about that. I am not a vegetarian, and I firmly believe that eating animals is not only tasty, it’s nutritionally superior. But I struggle a little bit with the ethics of it. I don’t think it’s wrong to eat animals; I just have trouble with how we get to that point. It bothers me a lot to contemplate the whole issue, so I feel kind of hypocritical. And wimpy. I think fishing and hunting skills are good to have. I admire my husband for having these skills, and I feel safer for him having them (you just never know when you’ll need them), but I’m glad he doesn’t go hunting. He hadn’t been fishing since we got together, either, until recently, when, at my suggestion, he took the kids to a fishing clinic. My daughter loves fishing in video games (particularly in Second Life), so she really wanted to try real fishing. I figured she’d find out that the real thing is a lot more boring and messy than it is in video games and would give it up quickly. But both of the kids took to it like, um, a fish to water. It’s been a great outdoor activity for them (gets them off the computer! ), and a great bonding activity, both with Dad and with each other. I, however, have declined to participate. When my son caught his first fish the other day, a small trout, the plan was to release it. However, it didn’t quite work out that way. Somehow, the fish died, and I found that to be very upsetting, especially since, in this case, it wasn’t part of the plan. Yeah, I know, the whole point of fishing is to catch and eat the fish, and somewhere between those two points, the death of the fish is a desirable occurrence. But that’s not something that’s talked about, is it? There’s the great sport of fishing, and then there’s the scrumptious fish fry. But no one talks about the death of the fish. I told my husband to bring home the trout, even if it was small. By golly, I didn’t want him to have died in vain. That probably wouldn’t be any consolation to the fish, though. An animal rights activist would tell me, “That’s right!” But many others would say I’m giving the fish too much credit as a sentient being. I’m not even too happy with the whole catch-and-release thing because I worry that it’s traumatizing to the fish, and I can’t imagine how it wouldn’t be painful. I worry about the trauma and pain and living conditions of farm animals, too. Before I met my husband, my daughter and I rarely ate meat; I really don’t like to handle it, and the whole ethicality has always bothered me. But then I married a voracious carnivore, which meant I had to start cooking meat for him on a regular basis. It also meant that I obtained health insurance, through which I learned that my years of near-vegetarianism had left me profoundly anemic due to severe iron deficiency. So now I eat meat daily. But I still struggle with the ethicality of it. And I support my kids going fishing, though I’m really struggling with the ethicality there. It’s one thing to eat meat because your body needs it (and yes, I know that many vegetarians would argue against that), but I’m not sure I can ethically justify recreational fishing. I just feel too sad for the little trout in our freezer. This entry was posted in Family, Values. Bookmark the permalink.